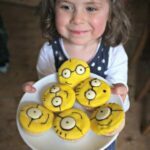 Welcome back to this weeks Kids Crafts – things for kids to make. 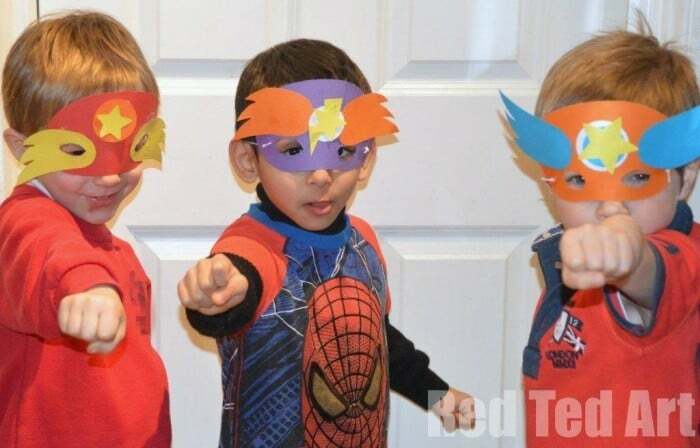 Today, we are sharing our DIY Superhero Masks! Some of you may know that Red Ted recently turned 5 (Happy Birthday dear Boy!) 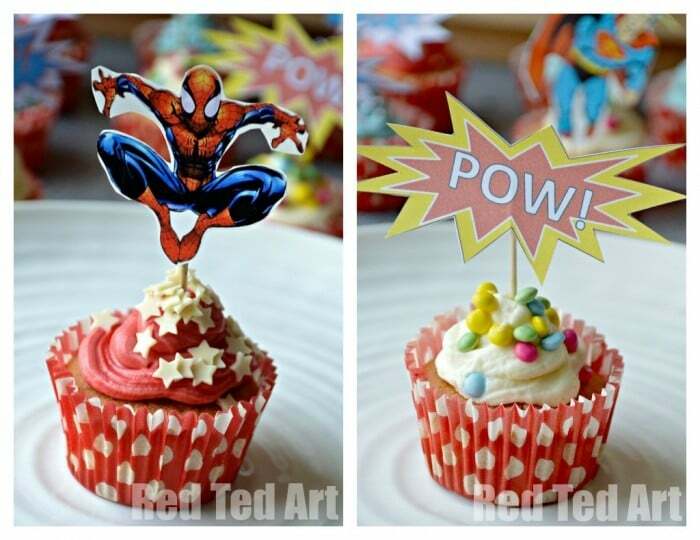 and that he had a SUPERHERO birthday party! 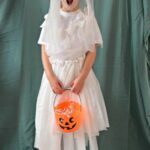 I really wanted to do a birthday party craft activity of sorts with the kids. (In my view) the key to any party activity is simplicity and preparation. 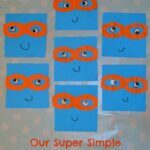 So I thought about our Superhero Stick Puppets – they really are nice and simple, but then decided against them, as already printed out lots of bits and pieces for bunting and cake toppers and I (!) was getting a little bored. 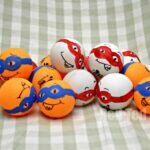 I also thought about the Superhero Stress balls, but decided it would be helpful to have more adults “help” for this, and we decided to run the party show with two adults (my husband and I) and ten kids! (in retro spect these would have made great part favours!). 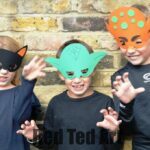 These Superhero masks are also great as a No Sew Halloween Costume! It is also the perfect addition to our Crafts for Boys series. 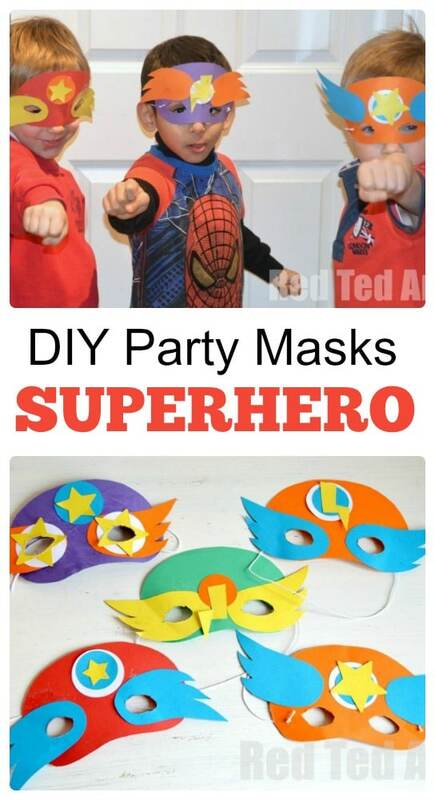 Note: this Superhero Masks DIY was first published in Feb 2013. We have updated and republished it for you. You could buy a set of stars and circles pre cut – either from craft foam or card. You could make the hole mask as a foam superhero mask or even a felt superhero mask – your call! 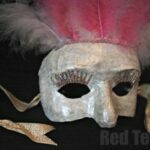 If making the masks for a small group (e.g. 2-3 kids), cutting these by hand is tolerable. I used my brand new Cricut Mini to cut stars and circles. It was the first time I had use it and it was pretty self explanatory (though there are a number of online tutorials that help. I just downloaded the “Cricut Craft Room” and went from there. I selected the free stars and circle images and arranged them on my page. They did have some “bolts” in their image stock, but they were part of a package and I didn’t need the whole package, so left it for now and cut the bolts by hand. The Cricut Mini was SUPER easy to use (I was rather impressed). My favourite part of it, is the “sticky feed map”. As you don’t have to use a WHOLE A4 sheet of card, but by placing smaller parts on the gridded feed map, you can easily use up odds and ends of card. Just be sure to match your grids on screen with the those on the feed map. Very clever and very thrifty indeed. I look forward to using my Cricut more! 1) Use these free printables for basic mask templates (print to fit A4). I managed to cut 5 masks at a time using the template – we cut the eye holes in at the very end, to make sure it fit each child. 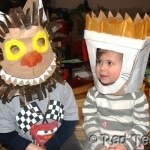 2) Cut your embellishments and masks. As this is for a party, I decided that I needed to precut everything. I wanted to give the kids lots of colour and shape choices – so needed to cut extra – sod’s law one child would want 5 stars or something. That is where the cricut came in handy. If I had only been crafting with my two, I would have asked them what colours and shapes they wanted and cut it all as we went along. So I cut lots of circles in blue, white and orange. Lots of stars in yellow, blue and white and some yellow bolts. I also cut the “eye wings” ahead of time. We had 10 kids coming and I cut out 12 masks. Giving us two as back up. 3) Add the elastic first. Knot and tape in place – the tape will help prevent the card from tearing. 4) I prepped the table ahead of time. Again, if I was making this with just my kids, I would be doing a lot more “as we go along”. But with 10 kids, it is good to have everything ready. Arm the children with glue and let them get on with it. 5) Once they are done double check placement of eyes. Use the template as a guide, but place over child’s face and check. We used point nail scissors (that I have for crafting) to cut the eyes out. 6) Wear proudly and let mum take lots of photos! Done. Pip Squeak did the one on the top left – the ones with the stars for eyes. It blew me away. I love how young children just have their own ideas and imagination and she wanted “star eyes”, so “star eyes” she got. Lovely. 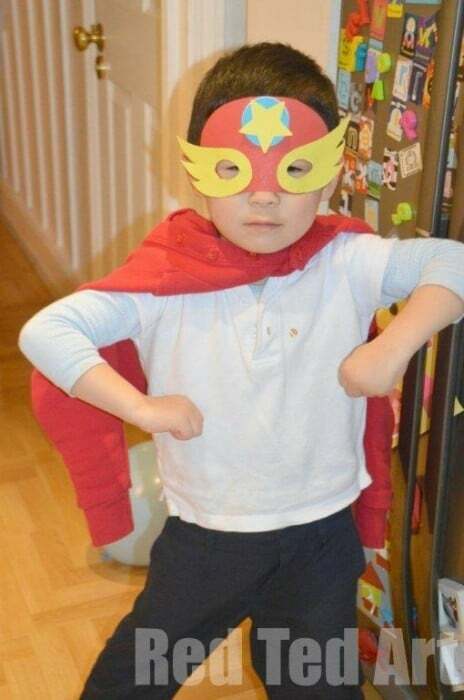 (And whilst you are here, check out our super simple Superhero Party Invites). 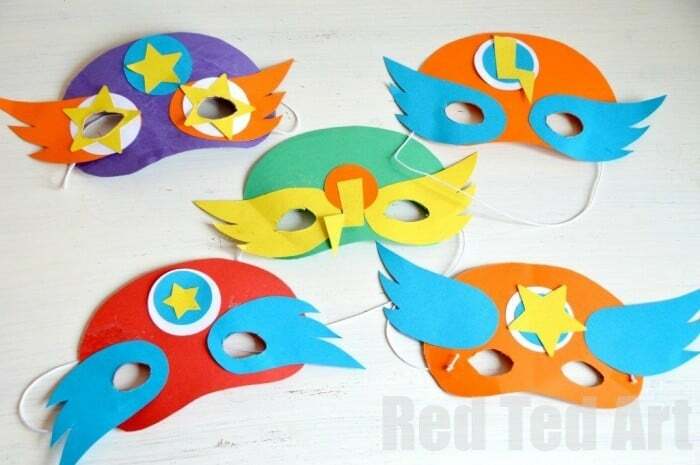 What are your favourite Superhero Craft Ideas? And what are your top birthday party ideas and tips? Did you use the Cricut? I used the Cricut for the stars and circles as they are “standard shapes”. I cut the rest by hand (yawn). Happy Belated 5th Birthday RedTed. Looks like a great idea for a party. Our craft party went really well too. The masks are fabulous. Great set-up, I can see us doing this for one of my playgroups. Awe thanks everyone, I need to still add a photo of Pip Squeak’s. Her’s was totally adorable and so “original”. Love how different they all were and yet had the same basic materials! PinkOddy – you don’t have to do a google Hangout – really – it isn’t for everyone! They look fantastic and thanks for sharing the templates too! Will be doing this with the boy and his cousins for sure. Great masks, Maggy! 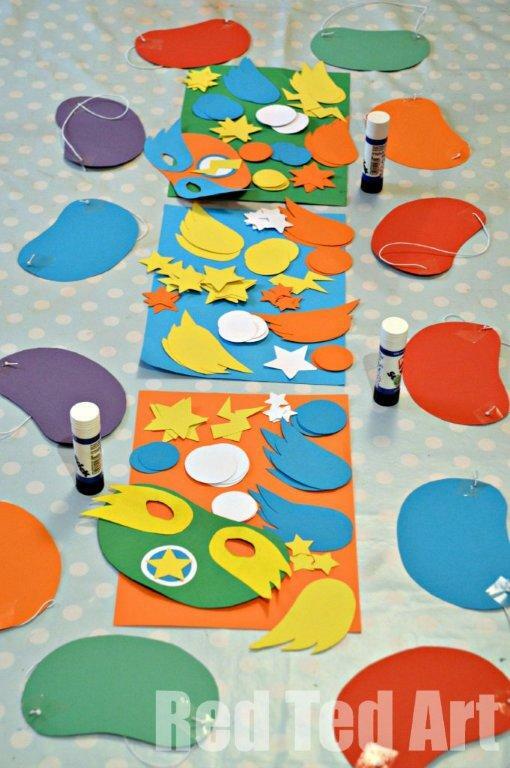 What a super activity for a super hero party! Those cupcakes look gorgeous! Great idea for a party activity! And happy birthday to Red Ted! Thank you everyone, I was surprised at how much the boys all seemed to enjoy the craft AND wearing the masks afterwards! Was lovely to see. I love these! I wonder if my little girls will be into the superhero thing. What a fun birthday party idea! Thanks for the link-up for all the great ideas! My little girl enjoyed making her mask (the one with the stars), but yes, not all little girls as into superheros!!! what fun! Great pics of the boys!! Wonderful party, Maggy! These masks are great! 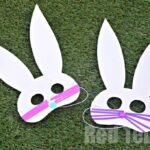 Adorable masks! Any little boy would love this craft!!! Thanks for this wonderful linky! Can’t wait to explore! My little boy loves everything super hero related, so will really love this. very cute thanks for including the template so we can make them too! My pleasure! I do hope you make some and that they templates print out ok!! I love these! I am having a bit of a superhero phase myself! Ooh yes, you can have one top! I love the star eyes! Very cute! hi, i love these and am trying to print them. but the link is gone? help….. I just checked an the links are working for me? Under the photo of the “individual boy” with the red jumper round his shoulders..? What a cute idea! I linked to it from my website http://CubScoutIdeas.com because it will be a great activity for the Cubs to do. I love these! Where did you find the elastic and how long of a piece did you cut for each mask? Hi! I can’t get the templates to work? Help please! Hi, I just checked the links seem to work ok for me… they take you to a JPG that you then print off in A4 or similar on your computer? What problem are you having? I can’t seem to get the links to work either! It takes me to a new page that says “page not found”. Thanks! Which link are you clicking on? Basis mask templates as well as superhero embellishments. I love this idea and want to use it for a library event I am hosting. When I click on the embellishments, I receive an error message that says the page does not exist. Is there a way to get an updated link to the document? Thanks so much! i like this kind of idea. It is simple but you can make your child his/her happiest birthday that can’t never forget. These masks are adorable. They are also simple that even a boy can craft them. Oh no, template links are not working – any chance you can share again? It works for me.. click on these highlighted words?